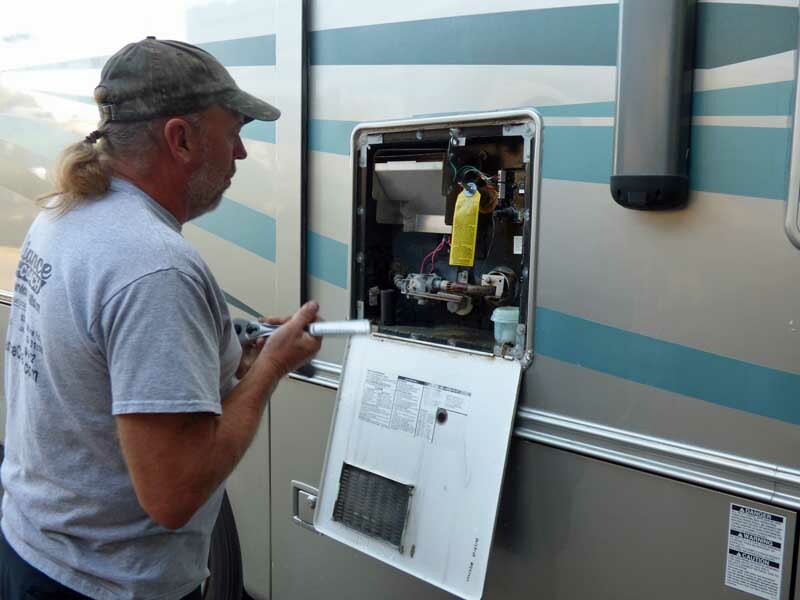 Mechanic Dave showed up at seven o’clock this morning and drove the motorhome into the shop. He asked what my problem with the kitchen faucet was. For a while now, the hot water has come out in a dribble rather than a good flow. The cold water comes out just fine. The hot water in the bathroom has a good flow. 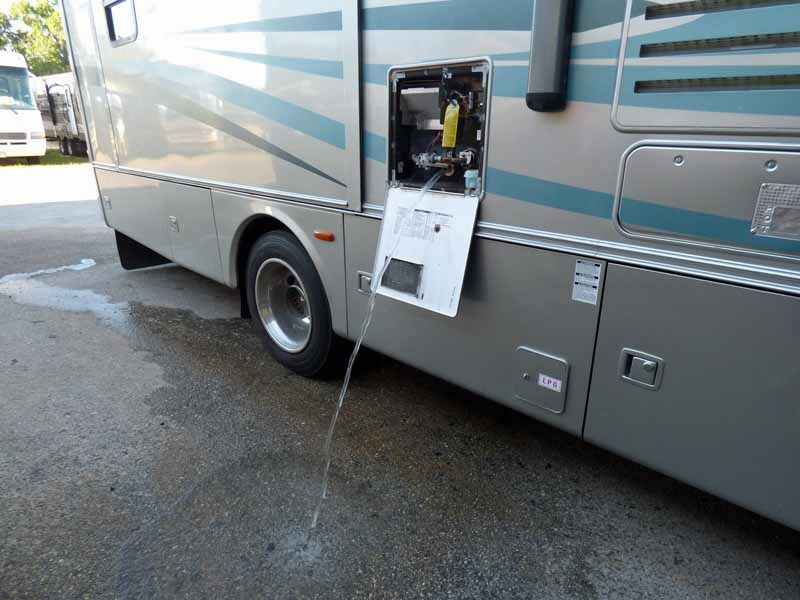 Dave thought it might be the diverter valve in the faucet; they sometimes go bad. But the faucet is only four years old. He decided to check the water-heater-bypass valve. To do that, he had to drain the water heater (ten gallons). 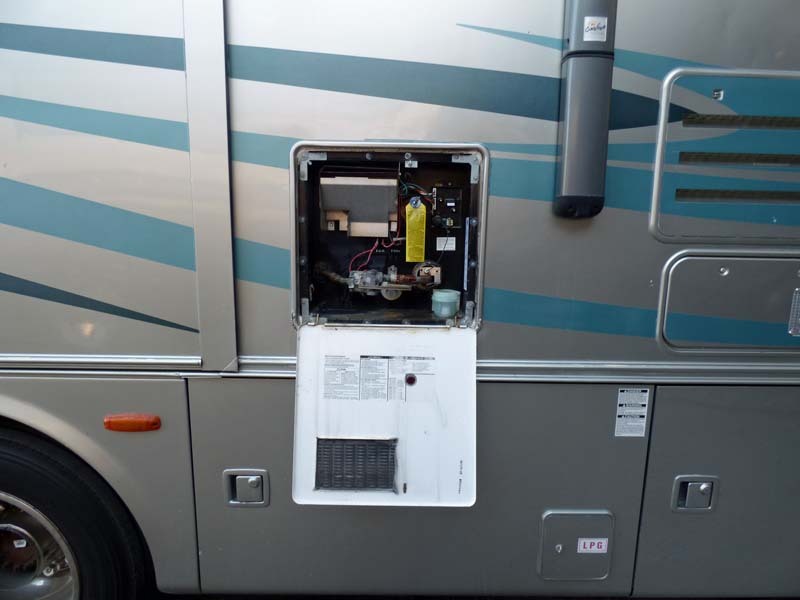 The is the back side of the water heater, from the outside of the motorhome. Dave removed the cap from the drain. Andy and I stood there watching the ten gallons of hot water drain out and onto the pavement. I said I should have taken a nice, long hot shower with that water. Andy said, “I have to go pee” and headed to the men’s room. From the inside, the water heater is in a locker underneath the washer/dryer. Dave got busy removing the bypass valve. It was a mess. The O-ring was broken and the check valve was in pieces. He installed a new valve and refilled the water tank. The hot water flow in the kitchen sink had not improved. Then Dave decided it HAD TO BE the faucet. Andy and I headed to Lowe’s in Leesburg to buy a new faucet. 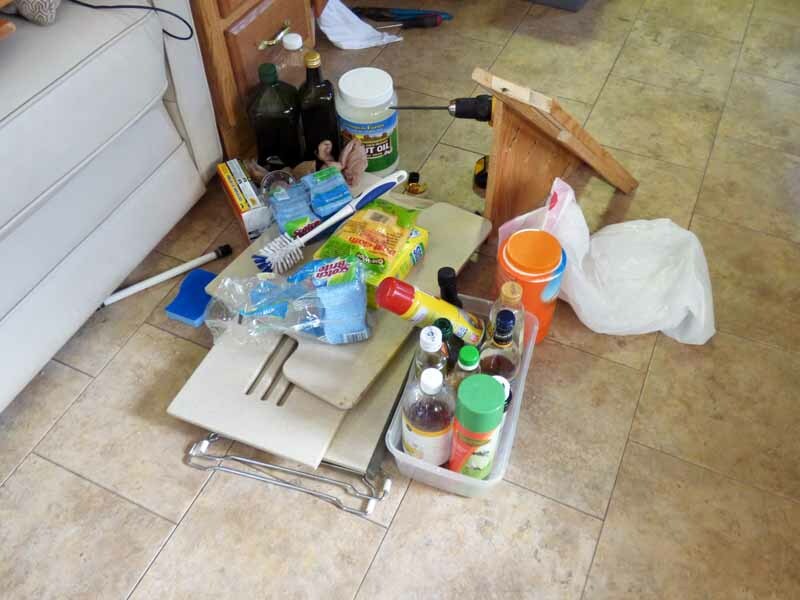 When we got back, the old faucet was off the sink and the stuff stored under the sink was on the floor. Dave installed the new faucet and the hot water flow is great. It looks pretty much like the old faucet. This time, I had him mount it so the lever is on the front rather than the side. It seems a bit more intuitive to me. After four years with the old one on the right side, I still messed up regularly and turned it hotter rather than off. You would think my burned hand would send a message to my brain and I would have learned. But I didn’t. Now, the lever straight up is in the cold position. Pulling it toward me in on. To the left is hot (that seems more natural). Pushing it away from me is off. We’ll see if I can manage this one a little better. This way is easier to reach with either hand. 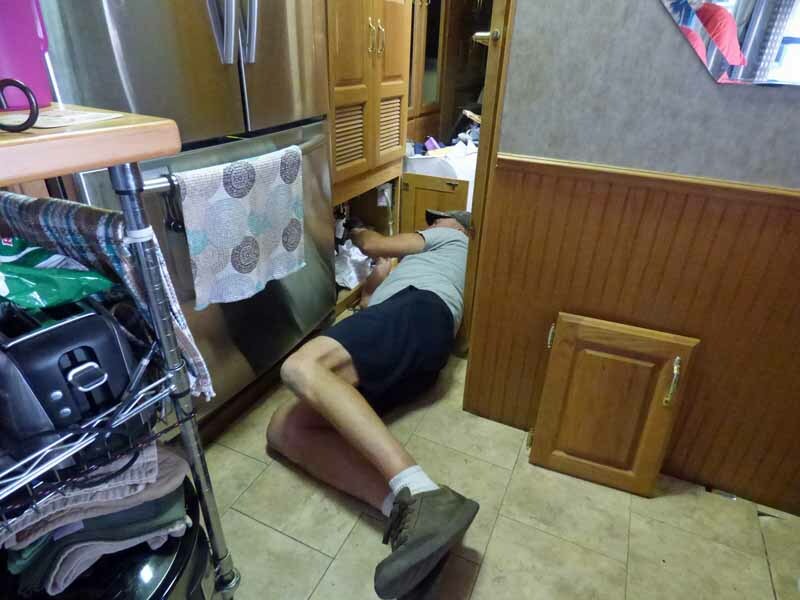 Dave inspected the old faucet and decided the issue was not the diverter valve, but corrosion. The faucet was clogged with calcium and, maybe, crud from the water heater. I suppose we could soak it in vinegar for a month and clean it out. But, I couldn’t wait that long for water in the kitchen sink. Faucets cost more but don’t last like they used to and I hear you regarding the hot water on the ground. I replaced my 40 gallon hot water heater last year (the second one in 13 years) and he drained the hot water through a garden hose down the drain. That doesn’t even include the cost of the plumber. Oy very! Am not sure that there’s ANYthing intuitive about that style of faucet. Jon & Page Hill have two of them in their twin kitchen sinks. No matter which way i push either one of them i don’t get it right! I’m glad to hear it’s not just me! 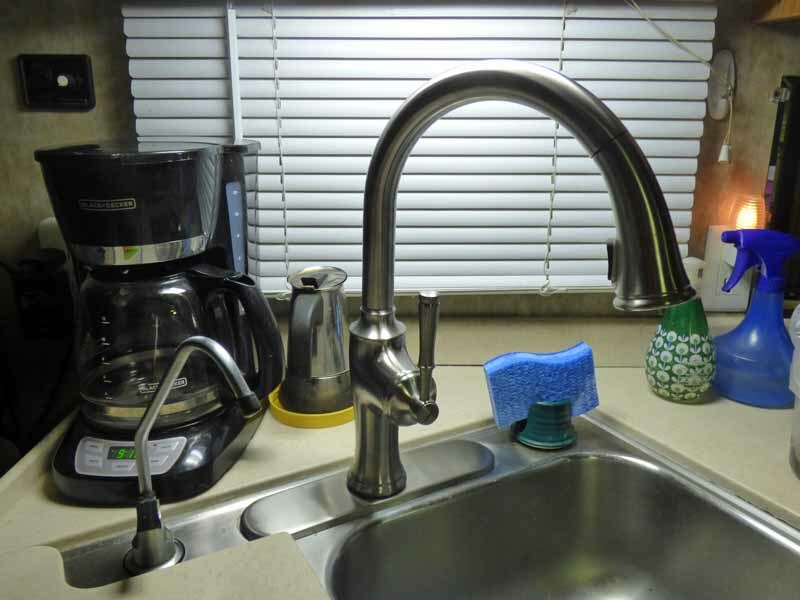 I have felt so stupid over that faucet for several years now. Glad you got it fixed! Wondered if it was clogged with lime or calcium while reading your blog. So glad you got it fixed in the end. Me too! I am not fond of cold dishwater.